La Galeria Elefante is an extraordinary concept store outside Santa Gertrudis on the island of Ibiza with it’s own beauty rooms and yoga studio. It is co-owned by British born Victoria Durrer-Gasse (who has lived on the island since she was 11) and her friend Sharon Bar. 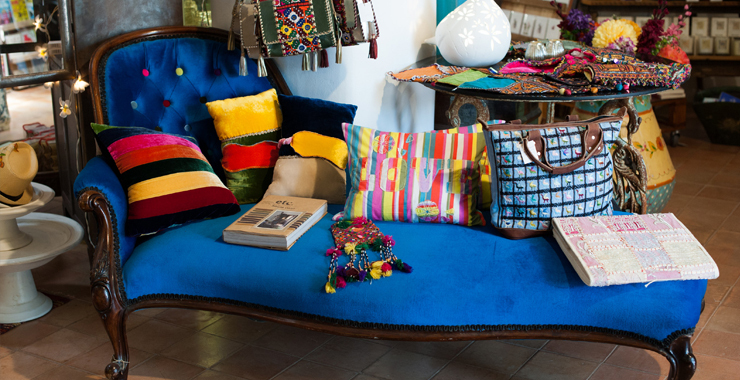 La Galeria is a treasure trove of luxurious and dazzling soft furnishings, artwork and furniture as well as gifts, clothing and jewellery in beautiful vibrant colours. Working alongside NGO’s enables La Galeria to support women workers and their communities around the world, including mothers & children in South Africa & Indonesia, orphanages in Nepal and the Self Employed Women’s Association (SEWA) which works across the whole of India. Giving back is at the heart of La Galeria Elefante’s ethos.